These little pretties prove that an impulse buy at the grocery store isn't always a bad thing. Best $4.99 I've spent in some time. The white is perfect. Don't you just love flowers! Pretty! Are they carnations? They last FOREVER!! They sure are pretty! White is so fresh and nice for winter! I love the little ribbon you put around the vase...and the book! They look pretty in the jar, too! Sweet hugs! A fresh bunch of flowers always perks up a space. Love the white flowers in the jar! I'm so glad you linked up for Fresh-Cut Friday! This is such a cute post. I love the red and white! How pretty! I love white hydrangeas from the grocery store, after Christmas. There really is something so fresh about white flowers! It's amazing how pretty flowers can brighten up a space! For $4.99, why not? I love the red & white gingham ribbon...pulls me right in! Yay! You were in my inbox this morning! :) The flowers are lovely and look so pretty in the mason jars. Have a wonderful weekend! Love the white....and so pretty in the jar! Have a great weekend! Such pretty, wintry flowers :) I love the mason jar for floral displays. For the holidays I did several arrangements for one of my table displays(it's a blog post). So fun! Thanks for coming over. So good to see you again. The flowers are lovely. I try and treat myself to flowers (mostly roses) about once a week or so. They are worth every nickel we spend on them. Oh....so many congratulations and blessings on your new home!! Luv it! got some roses right now. Just finished catching up on some of your very lovely posts! Your new house is simply gorgeous! May you have many interesting moments creating personal spaces that represent you. BTW, your previous gardens were spectacular! 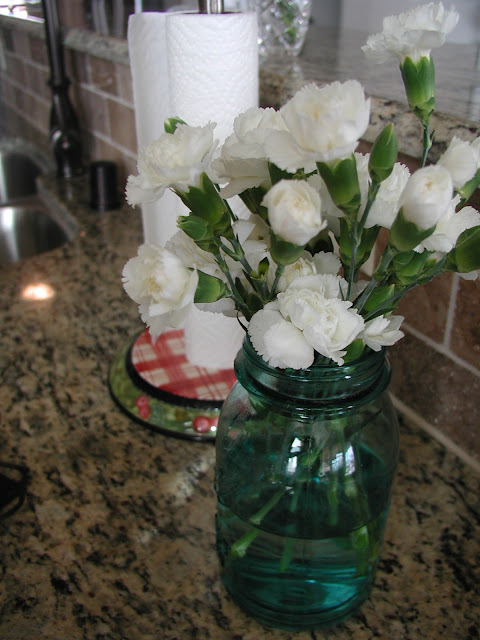 White carnations are always so pretty grouped together like that. They will last a long time too. That's a nice way to bring in some "summer charm" to your kitchen right now too. How pretty! Best $4.99 you ever spent! Oh those are just beautiful! I sometimes pick up flowers when I am at the grocer- a bit of a splurge, but they make me smile! Happy New Year to you! Oh they are so pretty. I love white carnations at this time of year. I may just pick some up when I'm at the market tomorrow. So pretty! Fresh cut flowers are one of my weaknesses. I could have them in my house all the time. I saw some huge mixed bouquets in the store today for $15, which I thought was a good buy. Hi Stacey! What lovely flowers and I agree, we need to treat ourselves to some pretty blooms from time to time. Thanks for popping in to see ma and Happy New Year! I love "grocery store" flowers, too! They are such day-brighteners, for any day of the week, and last forever. I was trying to read the inscription on the cloth in the first picture and all I can see is "Goodness Gracious." Would love to know the rest of it. Thank you, Stacey, for stopping by Southern Lagniappe, and taking the time to leave such sweet comments. I always enjoy visiting you and your new home, and can't wait 'til spring to see your landscaping projects. I know you're going to make your new yard as beautiful as the one you left ... and won't it be fun! Your flowers are so pretty, Stacey! I hope you have a wonderful weekend.